A metal detection system was recently installed for a large supplier of fruit and vegetables in Western Australia. 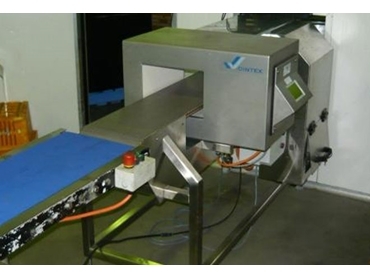 Supplied by Accuweigh 's Willetton branch in Perth, the metal detection system ensures the client's pre-packed food products are free of metal contaminants. The metal detection system scans packs of fresh salads and vegetables scheduled for delivery to local stores of a major Australian supermarket chain. Metal detection systems are almost a mandatory requirement in the food industry to protect both the consumer and wholesale suppliers, as many contaminants enter the food chain well before the raw products are delivered to the food processing company for packaging. Accuweigh's latest generation metal detection system has a multi-frequency scanning ability which allows for much higher sensitivity levels for detecting contaminates over a multitude of products in various pack sizes and configurations. This gives food wholesalers confidence that their pre-packed products are free of metal contaminants. The AccuCheck food metal detector is manufactured in full stainless steel with both audible alarm and a reject mechanism that automatically ejects the suspect items into a locked rejects bin for later review. Accuweigh has branches in all mainland states, offering complete after sales service and support on metal detection systems, x-ray food inspection equipment and high speed checkweighers.